Not enough praise can be bestowed on Denis Villeneuve's independent film adaption of Scorched, a play by Wajdi Mouawad. It is by far his finest film, realistically and emotionally vivid against the stark backdrop of the past and present in the Middle East. Although the film opens with a twin brother and sister being told that their dead father is alive and that they have another brother, much of the story splits between their mother, Nawal Marwan (Lubna Azabal), and the daughter, Jeanne Marwan (Melissa Desormeaux-Poulin). The mother's experience plays out during the Lebanese civil war; the daughter's journey takes place today as she traces a family history that neither she nor her brother ever knew existed. The son, Simon Marwan (Maim Gaudette), re-enters toward the latter half of the film, but only after his sister urges him to join her in fulfilling the last wishes of their deceased mother. He does eventually meet her in the Middle East, along with the Notary Level (Remy Griad), but only after Jeanne finds evidence that they do have a brother and that their father is very likely alive. Incendies remains apolitical to tell a more poignant story of family. As a fictional work, Incendies never overtly focuses in on its historic origin. However, it is largely understood that the broader context is the Lebanese civil war, which stretched from 1975 to 1990. During this 15-year period, it is estimated that approximately 200,000 civilians were killed, largely over opposing beliefs. More than one million people are still displaced because of the conflict. The true pain endured by the people comes to pass during one of many penetrating and chilling scenes. After one of the factions opens fire on a civilian bus, the three survivors — a young girl, her mother, and Nawal — are unsure of what to do until the armed men begin to douse the bus in gasoline. Just before the first flames begin to spread and erase any evidence, Nawal reveals herself to be a Christian. She is granted safe passage, but not before she empathetically tries to claim the young girl as her own daughter. In this atmospheric tale that frequently challenges kinship and ideology, it is neither the first nor the last time that family and philosophical bonds are tested, strained, and undermined. What begins as a forbidden love affair for Nawal quickly loads up as a burden she has had to bear until her death. Therein also lies the incongruity between the timid and scattered mother that her children have come to know and the past she chose to leave behind. However, in giving them the tools to uncover the truth, she leaves them with something that will forever haunt all of their lives. For all three of her children, everything they had come to know as the truth will have to be rewritten. 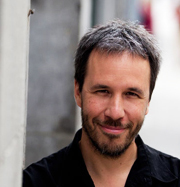 About the storytellers: Denis Villeneuve and Wajdi Mouawad. Denis Villeneuve is a Canadian film director and writer who began a successful career early by winning a youth film competition in 1990. He has gone on to win best director and best picture for three films in Canada, with Incendies being the latest film to be so honored. 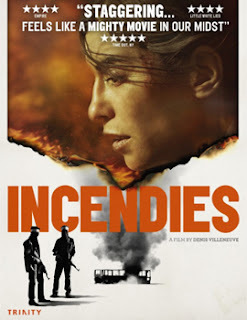 Regardless of his numerous wins, Villeneuve was so surprised to be nominated for an Oscar for Incendies that he could not sleep after learning it had been nominated. He decided to make the film after seeing the play by Wajdi Mouawad in 2004. Taken in by its dark beauty, he pitched the film for funding. In retrospect, he said that he wished he knew more about the Arabic culture before he started filming. However, he did learn a significant amount while shooting some of it in Jordan. He also had an excellent guide within the pages of the original play. While Mouawad is also a Canadian writer, actor, and director, he was born in Lebanon in 1968. He also lived briefly in France before moving to Quebec. In his play, Mouawad does an outstanding job reviving the art of a theatrical tragedy but with the dressing of recent history. The film accomplishes much of the same, but with the added elements of slow burn suspense. Incendies Ignites An 8.4 On The Liquid Hip Richter Scale. Although the Academy Awards awarded an Oscar to In A Better World, Incendies is still a fierce reminder that the film field is rapidly changing and evolving. There are an increasing number of foreign films that are easily on par with or surpass the quality of anything made in Hollywood. More of the world seems to know it too. Villeneuve was recently named one of the top ten filmmakers to watch. Go ahead and add the three principal actors to your personal watch list too: Azabal is riveting; Desormeaux-Poulin is enduring; and Gaudette is believable. You won't remember seeing subtitles. Incendies is available from iTunes. Incendies (two-disc blu-ray/DVD combo) is available on Amazon. Barnes & Noble also carries the combo. It is the kind of film you will want to watch again because its punch is in human behavior more than a mystery unable to withstand a spoiler.